With Fish ‘O’ Mania qualifiers beginning a full month earlier than in previous years it was fast approaching my first of three in this year’s competition. This would see me taking a trip to Solhampton Fishery in Stourport-on-Severn, a venue I had never fished before. For this reason, I decided I would fish an open match (especially arranged by the venue’s owners in the build-up the 140-peg Fisho qualifier) to ensure I had at least some knowledge of the venue and to make sure I wasn't going into the match completely blind. 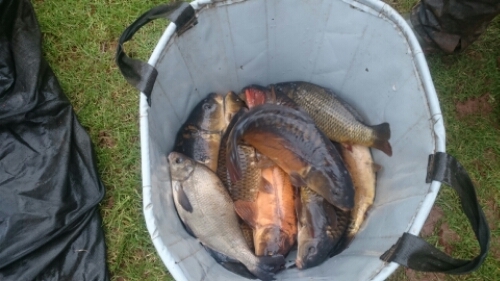 Solhampton Fishery houses seven lakes totalling 195 pegs. Each lake is stocked with plenty of species – carp, tench, bream, ide and roach, to name but a few. All the lakes have their own parking and the complex also has an on-site tackle shop and café. During the summer months match weights regularly exceed 200lb and the all-time record is 325lb. Having made the relatively straightforward journey from Cheltenham and arriving at the venue with plenty of time to spare, I decided to chat with some of the regulars and the owner to get as much information as possible. The day’s match would be held on Valley Pool. However, come the day of the qualifier, all seven lakes would be included, so finding out as much information about these was also vitally important because I’m simply not going to have the chance to fish them all before the day of the big match. The majority believe that Duck Pool is the one to draw on the qualifier and that a couple of pegs will almost certainly throw up the sort of weight needed to win and qualify for the finals weekend. A couple did highlight that all of the lakes are capable of throwing up some really good weights. I don't expect the sorts of weights that have been known during the summer months, but I do expect the winning weight to be around 120lb, especially if the weather warms up a few degrees. At 9am the draw was made. The competition seemed to be a mix of venue regulars and a couple of guys who had also decided to use it as a practice for the Fisho qualifier. I picked Peg 29, an 'alright' peg according to most of the guys, including the owner. I was reasonably happy with the peg. Valley is an open lake with no specific features other than some reed-lined margins. It therefore makes the lake reasonably fair and, according to the locals, pegs all over the lake have been known to produce match-winning weights. My plan of attack was to focus on three main line. Firstly, a long line at 13 metres, where I found the depth to be around six feet. Float choice was a 4x14 Daiwa KC Carpa 1, down to a 0.12mm hooklength and a size 16 B911 F1 hook. This was teamed up with white Hydrolastic. My second was a short-pole line at five metres. Here I decided on a 4x12 Daiwa KC Carpa 1, 0.12mm hooklength and a slightly stronger, size 16 B911 hook. This time a Preston Innovations 13H elastic was used. Finally, a margin line. I would usually situate this tight to a marginal feature or bank. However, in my margins I found just a few inches of water, perfect for summer but with temperatures of just 3ºC fish were unlikely to venture that close in. I therefore decided on finding three feet of water, which was about two metres from the bank to my right-hand side. Float choice was a 0.2g Carpa Ape and 0.14mm hooklength, a size 16 B911 hook, and 13H elastic completed the setup. Following an initial feed on my short line, I started the match on my long-pole line, feeding through a small Cad Pot with just a few pellets and a couple of pieces of corn, lowering my rig among the loose offerings. It didn't take too long before my float dipped and my first fish of the day was in my net, a skimmer of about 10oz that had fallen for my pellet hook bait. My second put-in again produced, this time waiting around 10 minutes for a bite. My first carp of the day was the result and found its way into my net after a spirited fight. A theme seemed to be emerging and over the next hour I caught another five carp between 1lb and 3lb, by no means prolific but a solid start nonetheless. Feeding a small amount each put-in seemed to be working, or so I thought. After a good start my fortunes changed and my next three put-ins resulted in the exact same outcome, a similar wait for a bite and then lost fish due to foul hooking. Having attempted to catch off the bottom unsuccessfully, I decided to change the way I was feeding the swim in an attempt to pin the fish to the bottom. They seemed to be coming off the bottom to compete for the bait I was dripping in. I decided to feed solely corn, which sinks quickly, hopefully focusing the fishes’ attentions to feeding on the bottom. Despite this change, it seemed that the commotion the lost fish had caused had killed the swim. At the mid point of the match I estimated a weight of around 20lb. Although this wasn't too far off the pace I could see that a few people had caught well from the off, including some much bigger carp than those I had caught. I had fed my short line from the start by hand and the big pot on my cupping kit whenever I felt it necessary. With half the match remaining and my long-pole line in need of a rest, I decided to drop onto my short line. This instantly paid dividends and within a minute of me lowering my rig in I had my first fish from this line. I could tell straightaway that this was a bigger fish and a carp of around 6lb was the result. The next hour saw me go on a good run of fish, catching a mixture of skimmers and carp. The skimmers tended to be around the 1lb mark, whereas the carp ranged between 1lb and 6lb. During this spell I had more than doubled my overall weight. However, as had happened on my long line, a lost fish due to foul hooking seemed to kill the swim. Strangely I hadn't been missing bites, which is usually the telltale sign that fish have moved off the bottom and made it difficult to read the swim, often only finding out when it was too late! The final hour wasn't overly productive and it was a case of rotating my three swims trying to pick up what I could and hoping a few fish would settle over one of my lines. My margin line failed to produce despite dropping onto it at various points throughout the match. However, I did manage to have one more carp from each of my long and short-pole lines in the last 15 minutes to end the match well. On the all-out I was certain there were better weights than mine, I had caught well in spells but consistency was the issue. I would catch a good run of fish but then the swim would go quiet for long periods. I suspected fish had moved off the bottom at different points of the match but catching them was a different matter and no bites came while trying to target them. This could have been a sign that some are still in winter mode, drifting about off bottom but not actively feeding. Changes to feeding in case fish were competing for bait, to try and get their heads down, also didn't work a lot of the time. Weights looked pretty consistent all around the 30-peg pool. By the time the scales made there way to me there had already been some good weights on a bitterly cold day. I estimated having between 50lb and 60lb. I knew that the guy two pegs to my left had caught well all day and this was reflected in his weight of 82lb 4oz. The next biggest at this point was 60lb 8oz with a couple of weights in the 50s and 40s, with the majority falling between the 20lb and 40lb. My first net went 29lb. An okay start but, knowing I am usually pretty accurate with the splitting of my fish, I expected there to be about the same in my next net. This was confirmed when my next net went 31lb 1oz, giving me a total of 60lb 1oz and putting me into 3rd overall, annoyingly just 7oz off second. It was not a bad result considering the majority of the day’s competition were regulars and had been fishing in the venue’s winter series for the last couple of months. Despite this, I couldn't help but feel that I should have done better. Nevertheless, what I have learnt could prove invaluable come the qualifier on March 19th.